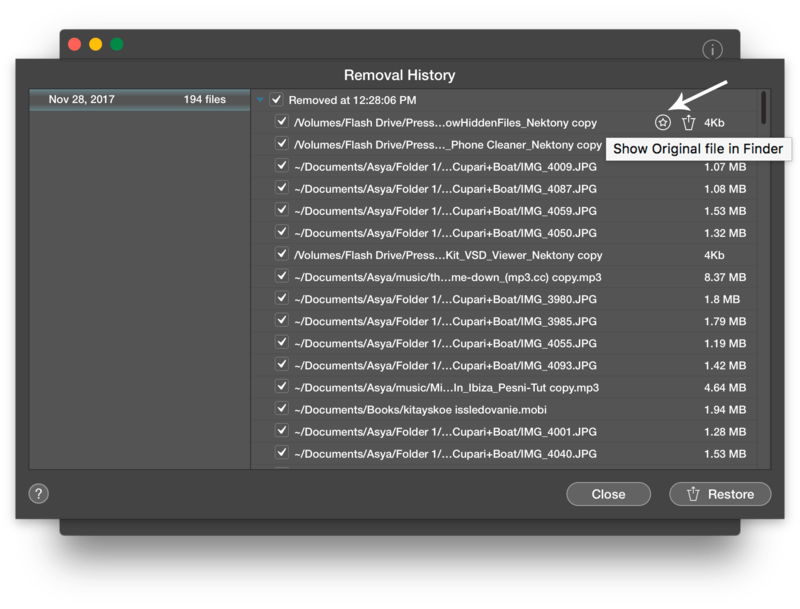 Duplicate File Remover Pro is designed to allow you to quickly clean up your Mac or external hard drives, from useless duplicate copies of files and folders. Duplicate File Remover Pro is an essential tool to quickly find all dupe files and remove them in a few clicks. However, sometimes it may happen when you remove both copies of your files and need to retrieve them back. In this article, we will tell you how to restore removed duplicate files. First, you should note, that when you remove files by Duplicate File Remover Pro, the program moves them to the Trash. However, this option is changeable. If you go to the Preferences → Remove section, you will see there a point “Remove Duplicates permanently.” By default, the option is disabled. If you have enabled it by mistake, you should know that the next time when you delete files with Duplicate Files Remover Pro, they will be removed permanently without moving into the Trash, so you will be unable to restore them. This option is useful to not waste time and empty the Trash after each time when you remove duplicates. However, if you are not sure which duplicates you should remove and which ones to retain, we recommend you to keep this option disabled, i.e. remove duplicate to Trash bin. If you want to save duplicates removal history and to be able to restore the removed duplicates, the option Log removed duplicates should be enabled. 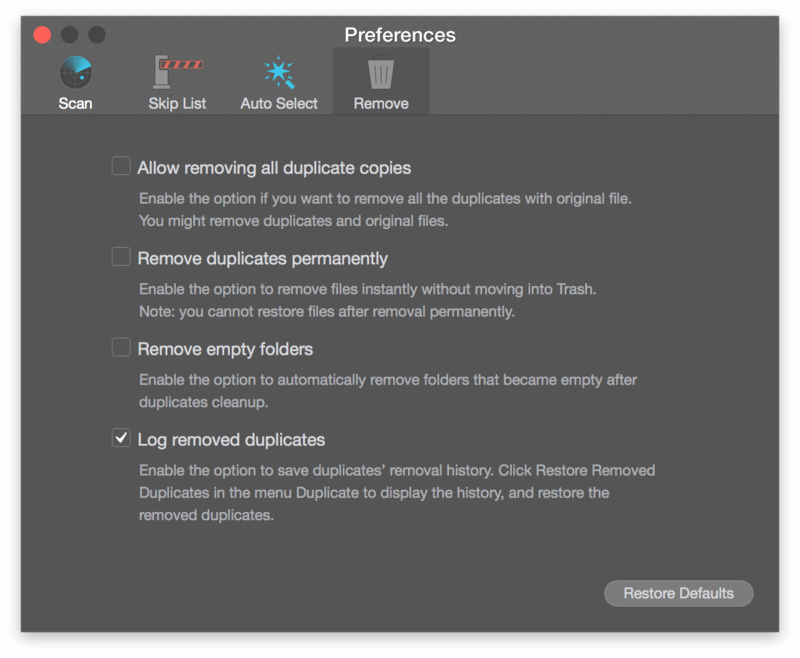 To Retrieve duplicates, go to the Menu Bar → Duplicate → select Restore Removed Duplicates. The program will show a window with a list of removed duplicates. 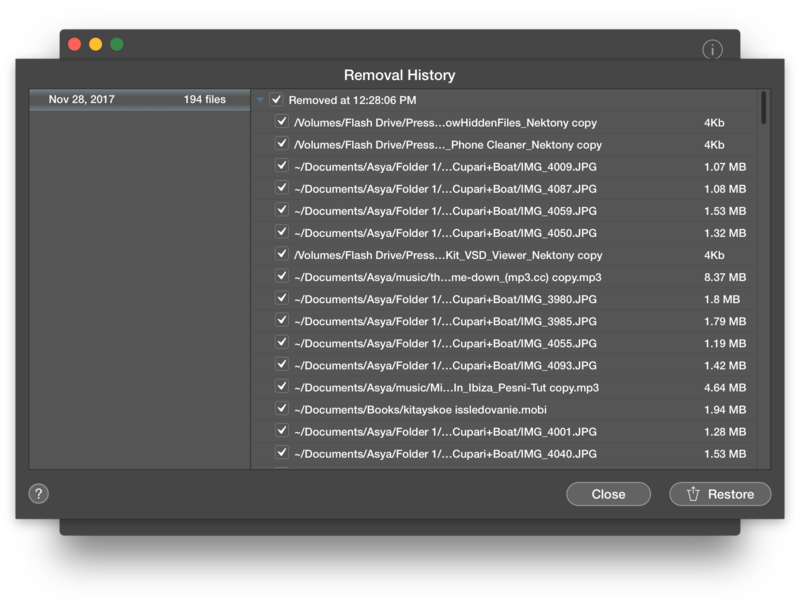 The duplicates are grouped by date and deletion sessions. Thus, you can choose any date session and view which files were deleted on this date. If the files are in the Trash folder, you are able to restore them. Just select files you want to recover and click the Restore button. Also, you can view where the original file for each deleted duplicate is located. For this, click the Star icon and the file will be shown in Finder. Isn’t it awesome? With Duplicate File Remover Pro you no more have to worry about deleting important files by mistake. You can quickly restore any removed file with one click.